There are some iconic duos out there: peanut butter and jelly, milk and cookies, and even bacon and eggs. However, there are some combinations that are better left separate, one of them being toothpaste and orange juice. If you have any children, you will know that getting ready in the morning can be a challenge. Children often don’t have an awareness of time as much as their parents do. They tend to “drag their feet” in the morning and have no regard for tardiness. Because of this, sometimes, breakfast has to be completed in the car with a light snack and a sippy cup of orange juice. Now, here is the problem with this scenario: your child has likely just finished brushing their teeth and now you have handed them a cup of orange juice for breakfast. It is a fact that orange juice and freshly brushed teeth do not mix. If your child takes a gulp of orange juice after brushing, they might have both a surprised and disgusted look on their face. 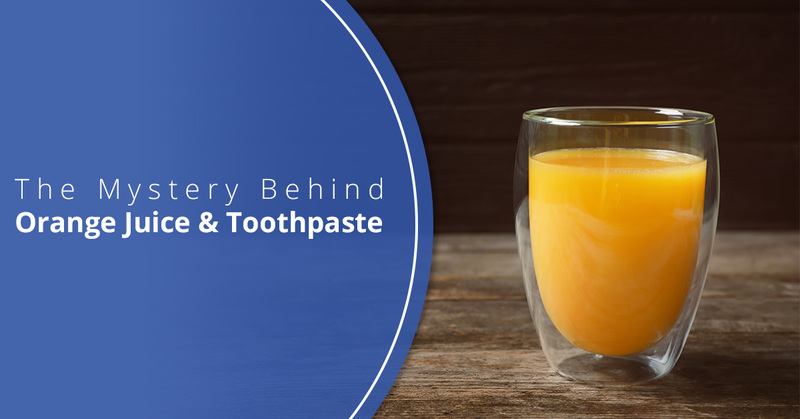 In this blog, we will discuss the mysteries of toothpaste and orange juice, and why these two do not mix well in your mouth. This blog serves as a warning for parents who are not yet aware of the gross mixture, as a way to prevent them from upsetting their children at the beginning of their day. When orange juice and toothpaste come in contact with each other, they create a bitter taste in your mouth. Sometimes, the taste is so grotesque that you will have to immediately wash out your mouth. For young kids, they may not understand what is happening and can get very upset. The best way to prevent this from happening is by clearly separating when your kids brush their teeth and when they sit down for breakfast. However, in this blog, we are more concerned with why this phenomenon occurs in the first place. It begins with your tongue. The human tongue is equipped with over 10,000 taste bud, each having 100 receptor cells. These sensors are each designed to match up with a particular molecule in your food. When the molecules and the tastebuds meet up, it allows the food to have a particular taste. There are some types of molecules, however, that can make your tastebuds confused. Typically, when this happens, the tastebuds will illicit a bitter response. Though these ingredients may seem a little intimidating, all of them are safe and useful for your teeth. For instance, abrasives are used to break down plaque on your teeth, while fluoride is used to ensure you don’t get cavities. Detergents are used in many household products and have proven very useful when it comes to cleaning your teeth. The detergents are commonly responsible for the foam or “bubbles” in your toothpaste. Detergents are useful for brushing your teeth, but they also are the culprit as to why orange juice can transform into something that tastes like battery acid. The reason this happens is that one of the compounds in toothpaste detergent, sodium lauryl sulfate (SLS), suppresses the sweet receptors in your mouth. Due to the fact that the sweet receptors are “blocked,” the tongue is left with tasting the bitterness of the orange juice. Because of this, it is important to always drink orange juice before you brush your teeth. It is important to brush your teeth after drinking orange juice for two reasons. One, obviously the bitter taste is less than desirable and can leave your mouth tasting metallic. Second, juice typically has a lot of sugar in it (both natural and added). Because of this, brushing your teeth will help remove those sugars from your teeth and prevent plaque build up in the future. At Chess & Taub Family Dentistry, we want to ensure that every family is getting the dental care that they need. We have a trained, experience staff members ready to take on new patients. We understand that dentist visits can be intimidating to children, which is why we strive to make every visit fun and exciting. If your child needs a local Jenkintown pediatric dentist, contact us today.